A key parameter estimated by lab and field experiments in economics is the individual discount rate---and the results vary widely. We examine the extent to which this variance can be attributed to observable differences in methods, subject pools, and potential publication bias. To address the model uncertainty inherent to such an exercise, we employ Bayesian model averaging. We find occasional but widespread publication bias against unintuitive results: in consequence, the mean reported discount rate is inflated twofold. Our results suggest that estimates decrease with the time horizon, a finding consistent with hyperbolic discounting. Discount rates are similar for money and health questions, but people tend to be less patient in exotic contexts (e.g., when offered a kiss from a movie star). Africans are less patient than people from other continents. Finally, the results of lab and field experiments differ systematically, and it also matters whether the experiment relies on students or uses broader samples of the population. 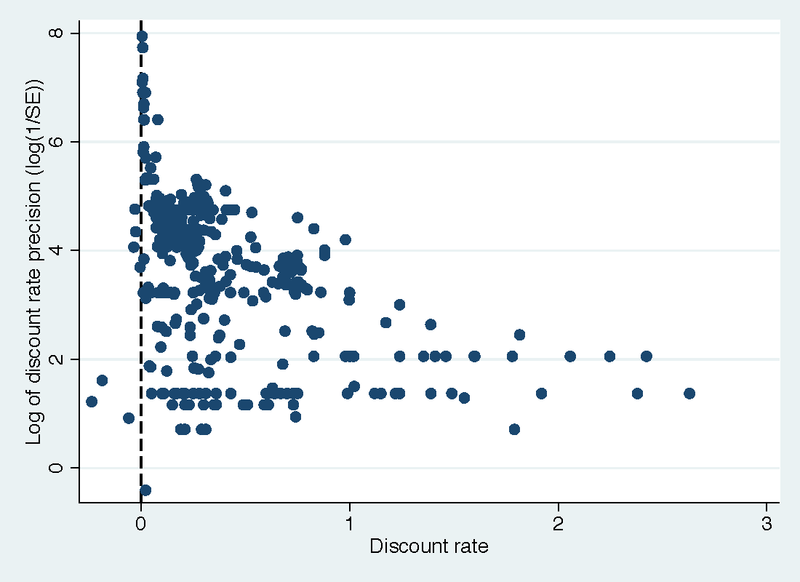 Reference: Jindrich Matousek, Tomas Havranek, and Zuzana Irsova (2019), "Individual Discount Rates: A Meta-Analysis of Experimental Evidence." Charles University, Prague. Czech National Bank, Research Dept.